Another month of wards has come and gone, and I'm tired but also in general very content with the going-ons of life. The presents are wrapped, there is a constant flow of cookies. We hosted a small secret santa with a few of my lady friends last week, where I procured some extremely nifty carriers for my cookies and cakes I've been bringing to the hospital. Between that and making sure that we order tasty deliveries every night we are on call, I've assumed the position of mama bear amongst my wonderful co-residents. I like it. In truth, it's been a little nice taking a break from baking for this blog. With the holidays there is just always so much going on in the social media world in the form of cookies, cakes, holiday hashtags, everyone prepping and loving the holidays. I love it, too. But I also feel like I barely have time to even get a home cooked meal on my plate, let alone do all the holiday things I meant to do this year. But it's okay. Working through the season actually has put a lot into perspective, reminding me the value of good health and good attitudes. I'm thankful for both of those things more than ever. That being said, I've still been doing all sorts of baking! It's my meditation on the days prior to long call. And it always, always puts a smile on my face the next day when my co-residents dig into dessert at 8 am and by noon, it's gone. So even though the work day is long, it's still full of good feels, full bellies, and a little sugar high. 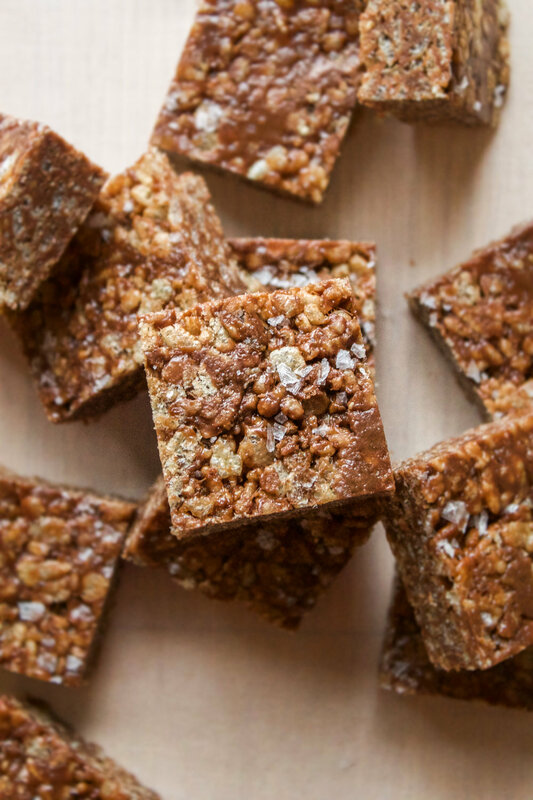 If you're busy but want to bring your co-workers something tasty too, may I suggest these rice krispies treats? They are ridiculously easy, simple, but have enough of that unique flavor from the nutmeg and sea salt to make them extra-special. They won't be disappointed. Happy holidays! Butter an 8x8 inch pan and line with parchment paper, leaving a 2 inch overhang. Butter the parchment paper and set aside. In a medium to large saucepan, melt the butter over medium heat. Once melted, turn the burner to low and add the marshmallows, salt, and nutmeg. Stir with a silicon spatula or wooden spoon until melted. Add the Nutella and stir until melted and smooth. Take the saucepan off the heat, and add half the cereal. Mix until most of the cereal is coated, then add the remaining cereal. Stir with a wooden spoon until well combined. Pour the mixture into the pan. Using a silicon spatula, press firmly into the pan until it reaches all of the edges of the pan and is in an even layer. Sprinkle with flaky sea salt, then let cool for 20 minutes. Cut into squares, and enjoy with a steaming mug of hot chocolate! And! These treats are part of a delicious virtual cookie swap - you can see all the goods below! A little baking inspo for your holiday season. Happy baking!